According to Derek Lategan, MD of Enforce Security, a residential estate security risk treatment plan should be intelligence driven. Thereafter, one can apply a converged blend of human resources, supported and enhanced by technology. Enforce Security, specialists in risk assessment and mitigation, have developed numerous risk solutions based on rigorous ISO 9001 systems and procedures, all operating within a centralised command and control environment. Enforce has a number of success stories within the residential estate market that include the deployment of thermal imaging CCTV cameras with analytics. Glenn Allen, Enforce’s technology director, points out that this technology has gained traction as it is able to alert security operators when criminals attempt to penetrate perimeter fences late at night. These cameras are especially useful in areas with very low lighting or where there is a prevalence of mist. Enforce Security has realised the importance of forming professional partnerships with consultants such as Rob Anderson and Associates. “Over the past 25 years we have leveraged these relationships to design dynamic security solutions that are customised to suit individual requirements. “Recognising the need for specialised consultative services, Enforce now also offers professional assessment services which include the development of personalised risk management programmes for clients. Flexibility and adaptability remain important factors, especially in an ever-changing environment and economy,” says Lategan. The company’s estate offering encompasses not only specific security personnel and training but also includes the full spectrum of on- and offsite CCTV surveillance, access control and admission solutions, TV distribution, fire detection, and private investigations. Enforce Security recently added bundled property services (Excellerate Services) to its business model, which incorporates manned security, security technologies, parking management, property care (cleaning, hygiene, gardening and indoor plants), pest control as well as a variety of ancillary services. 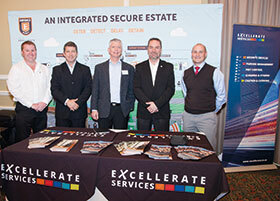 The company’s presence at the Residential Estate Security event allowed it to reiterate its increasing growth in the residential estate sector, highlighted by a number of successful deployments at, for example, Zimbali Coastal Estate.